It was unfortunate, perhaps, that one of the MEP’s pictured holding his head in his hands as Nigel spoke was formerly Lithuania’s most senior heart surgeon. And even more unfortunate that out of 751 MEP’s, Farage has the 747th worst attendance record. It’s one thing not to have a proper job. It’s quite another to be almost the worst person in the world at it. I was reminded of this as Jacob Rees-Mogg launched his latest broadside against Government caution, miserable Remainers and anyone else who looks like threatening the free trade nirvana of hard Brexit. Let’s be frank. If anyone has never had a proper job, it’s Jacob Rees Mogg. Yes, I know that he used to work for Rothschilds investment bank and set up a fund management firm that now has a bigger GDP than Tanzania, and that is exactly my point. Rees Mogg has never had employment in the ‘food on the table, pay the mortgage’ sense that most of us recognise. From the day he was born into a wealthy, landowning family, he’s has never had the stress or inconvenience of wondering how much is going to be in the next pay check, or even if there would be a pay check at all. Work for Jacob is a hobby, an extension of the privilege and favour that he, and people like him, have been aware of ever since they could spell the word ‘job’, let alone make a living from one. Such is the virulent partisan nature of the Brexit press, however, Rees-Mogg’s comments about there being a £135 billion windfall on the table if only the Chancellor would man up, were reported with the same evangelical fervour bestowed upon St. Paul’s Epistle to the Romans. There’s so many things wrong with this that it’s hard to know where to start. The obvious retort to make is that it’s all well and good for multi-millionaire politicians to indulge in their favourite economic fantasy when they know that win, lose or draw, their standard of living will be unaffected by the economic consequence of a hard Brexit. But more pertinently, arguing for the hardest Brexit now gives them a free pass in the future, since any ruinous outcome will be explained by the Government doing too little, rather than too much. It’s much like the impasse of negotiations is the fault of the EU for being rotten to us, rather than the fault of Brexiters for claiming we could have all the benefits of membership even after we leave. The claims being made for hard Brexit are the same theoretical arguments used by neoliberals over the past fifty years. If only we could get rid of all the red tape and regulation imposed by overbearing government (or the EU), businesses would be free to generate huge profits and wealth and prosperity for all would follow. There were two good articles this week calling out this dangerous nonsense. Rees-Mogg was speaking at an event organised by Economists For Free Trade. EfFT claim that current EU trade barriers are equivalent to a tax of 20% on both agriculture and manufacturing. In manufacturing only about 3.5% of the extra cost is tariffs, so what is the rest? They are the compliance, standards and regulatory barriers that are actually beneficial in creating a fair and equal playing field for free trade to take place – labour, health and environmental regulations – and that most reasonable people, Leavers included, would deem to be important. In many other areas, such as price theory, regulatory analysis, standards and trade modelling, EfFT calculations, in the words of a London School of Economics team of trade experts, “defy the laws of gravity”. Patrick Minford’s analyses have been publicly and formally rejected in a letter signed by 280 UK economists. I think this is really at the heart of the issue. Free trade also means freedom TO trade and in this regard, the EU has been hugely successful. If I want to sell my mousetrap in your market, then the things that stop me might be government-imposed tariffs; but they might also be the fact our markets have different regulatory regimes, so that none of my potential customers know whether my mousetrap is safe, or useful, or does what it’s supposed to. It is all well and good to abandon this regulatory framework, but freedom cuts both ways, and doing so not only could limit the ability of Britain to sell mousetraps into our biggest trading market (the EU), but also expose us to a flood of cheap and dubious mousetraps against which our doughty, better quality perhaps, but more expensive, Made In Britain version cannot compete. This is the consequence of trading on WTO rules. Instead of opening up a wealth of new mousetrap markets, all we end up doing is closing our domestic mousetrap industry, leaving very little alternative employment or prospects for mousetrap makers. This, of course, is what the EU has prevented through the single market. It’s been incredibly successful, in that it’s increased trade between the members of that market whilst encouraging other major trading partners – like Canada, Korea, China, the US and Australia – to enter bilateral agreements aimed at aligning and harmonising trade regulations globally. Countries like China and the US have been persuaded to do this because of the size, influence and downright attractiveness of a union that represents 350 million people. If you believe Britain on its own can replicate the influence of the EU in this regard, you are frankly living in the nineteenth century that Jacob Rees-Mogg is so fond of. Advocates for neoliberal ideas regard unrestrained competition as the fundamental principle governing human affairs. By regarding individuals simply as consumers or vendors, making entirely rational choices on the basis of whatever results to their best advantage, they argue that weakness and inefficiency can be eliminated with universal benefits. Over time, this should mean that the dynamism of the market place delivers supremely optimised systems to maxmise output and performance in almost any field. Theoretically, such market-based ‘survival of the fittest’ should inevitably yield the greatest prosperity by enabling the most successful exponents to emerge, from which outcome, every one else prospers via the trickle down effect. Any attempt to inhibit this competitiveness – whether it be via taxation, legal regulation, public (free) service, trade union collective bargaining – is a brake on efficiency and a distortion of the market and can be regarded as immoral because it prevents the system from doing the greatest good for the greatest number. 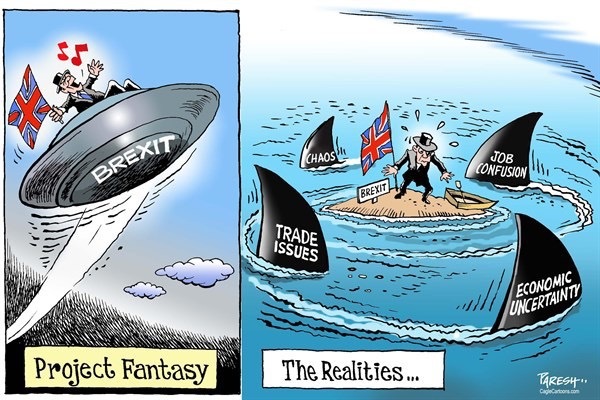 The problem with this approach, as we have seen repeatedly and especially during present difficult times is that the theory is a nonsense – just like the fantasies of Jacob Rees-Mogg, Patrick Minford and the Economists For Free Trade.